Why Does My Back Hurt? 1. At least 40% of people will experience Sciatica symptoms at some point in their lives. 2. Sciatica is caused by an irritation of the sciatic nerve. The most common reason of this is from a pinching of the nerve due to a herniated disc, bulging disc, degenerated disc, spinal stenosis, or spondylolisthesis. 3. The sciatic nerve is the longest nerve in the human body, and it travels from the lower back, through the hip and buttocks, all the way down the leg to the foot and into the big toe. There is a sciatic nerve on each side of the body, and it's about the size of a thumb. 4. Sciatica pain can be felt in several different ways, including numbness, a tingling sensation, a dull ache, a burning sensation, or muscle weakness. 5. The sciatic nerve actually begins as 5 nerve roots that exit the spine and then combine into one before traveling down the leg. These nerve roots are what usually get pinched and cause sciatica pain. 6. The pain from sciatica can be felt at any point that the nerve travels, depending on which area the nerve is being irritated. 7. It is possible to experience several different pain sensations at the same time, because more than one nerve root can be irritated at the same time. For instance, a common sensation is tingling in the foot, but it is possible to experience a burning sensation in the upper leg at the same time. 8. Most of the time people will only experience sciatica pain in one leg, but on rare occasions it can occur in both at the same time. 9. Minor cases of sciatica will usually go away in a few weeks on their own. But for many people it will keep coming back and getting worse, at which point treatment may be required. 10. Some people may think surgery is the best way to fix the problem of sciatica, but in actuality for some people in doesn't help at all, and for many others it actually makes the pain worse! At the Illinois Back Institute we strive to educate everyone as much as possible about their back pain and sciatica, because it is proven that the more people know about their problem the more likely they are to eliminate it! 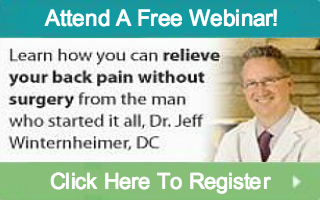 Our 9 Step Solution specializes in treating the causes of back pain and sciatica. Are you ready to put an end to your pain? Schedule a Free Consultation by calling us at 844-408-0462 or click here! Disclaimer: The content on this web site is for information purposes only and should never be used as the basis for diagnosis or treatment. We always recommend consulting a qualified professional before embarking on any form of self treatment or rehabilitation. All content is protected by the usual copyright laws and cannot be used, stolen or reproduced for any purpose without Illinois Back Institute permission. Please feel free to call about anything although we are unable to give advice on any specific injuries or conditions over the phone. Copyright Illinois Back Institute. All rights reserved.